What makes Pipeline Crossing so popular? Team Building Mission: Individual Contractors (Teams) must work together to build a marble delivery system called the “Pipeline”. 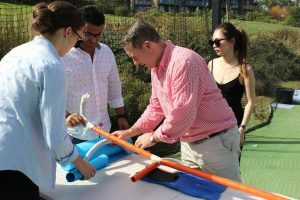 Indoors or Outdoors this fantastic fun team building activity will see independent teams collaborating together to each build a segment of pipeline that when connected will result in a marble delivery system capable of transporting a marble from start to end successfully. This will result in careful planning, design and skilled engineering to construct the pipeline to complete its objective. Creativity, out-of-the-box thinking, execution and teamwork are all vital ingredients if teams are going to successfully complete the mission. The program begins with some fun and exciting group challenges where teams will face-off against each other to earn funny money. This funny money will later be used at an auction where teams will be able to bid to buy additional items to help make their section of pipeline ‘mission ready’. Once the challenges and auction are concluded, each independent contractor (teams) will then set about delivering their section of pipeline. It’s now time to assign roles, create a design, liaise with other teams with regards to connection points and then begin the construction of their pipeline using construction materials which may include bamboo, plastic PVC piping, buckets, rubber bands, rope and other materials. Success between the pipelines depends on communication and collaboration, as marbles must freely travel from one end to the other, aided only by the laws of physics! After a short testing phase, to enable each independent contracting firm to correct any deficiencies in their design, it’s time to handover the Pipeline to the customer and witness the successful launch and delivery along the entire length of the Pipeline structure! 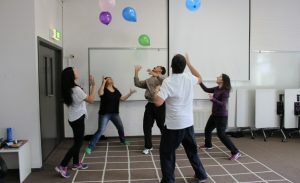 This is a great team building program that is designed, to give participants an opportunity to demonstrate teamwork, communication, collaboration, time management, creativity and have fun in the process. This team building activity is fun, enjoyable and can literally be enjoyed by anyone. It doesn’t require any special skills and is highly interactive and has an intensity level of low. Q: HOW MUCH AREA IS NEEDED TO RUN THIS ACTIVITY? We recommend you allow up to 4 sqm per person. So if your group size is 50 then you need 200sqm of area to build the pipelines.